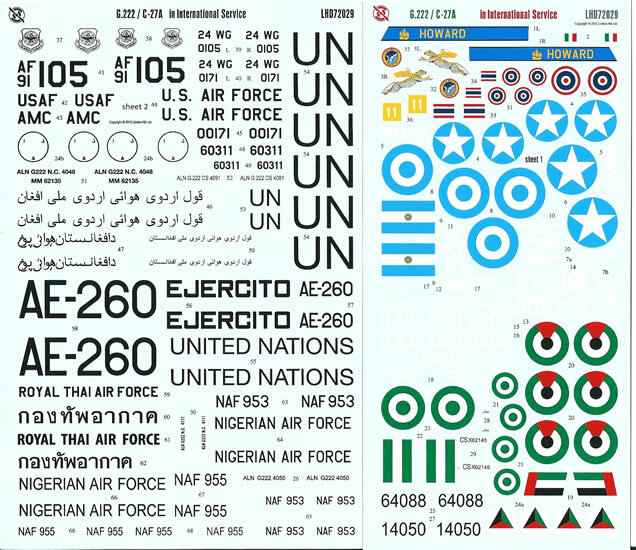 LHD72028 – Decals for eight subjects. 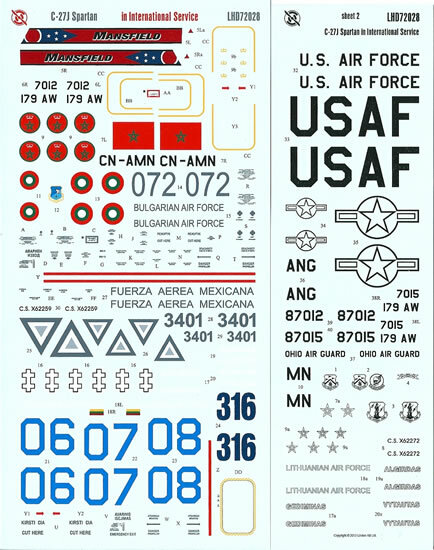 LHD72029 – Decals for eleven subjects. Very good quality, wide range of interesting and attractive markings, with thorough research and attention to detail. Both decal packages appear very well researched, with thorough attention to detail, and are produced to the highest standards. They offer a wide choice of colour schemes and the chance to build a model in the colours of several smaller air forces. As such, they are a most welcome alternative to the kit markings. Definitely recommended. I like transport aircraft, especially those of the 1950’s. This said, I also think that many more modern turboprop transports make impressive modelling subjects too. 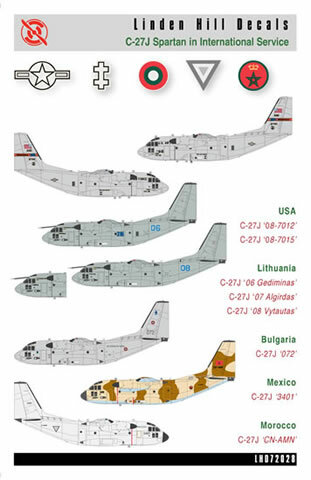 Revell’s C.160 Transal along with Italeri’s recent C.27 Spartan and A-400 Grizzly are good examples of this type, not to mention a number of Russian types from A-Model and Roden. Unfortunately, for me at least, I find that the modern overall grey low-visibility schemes that often accompany these kits a bit uninspiring. Certainly, this is what has helped to delay me from building my Spartan kit. Well Linden Hill has come to the rescue as far as the widely used C.222/C-27 design is concerned. 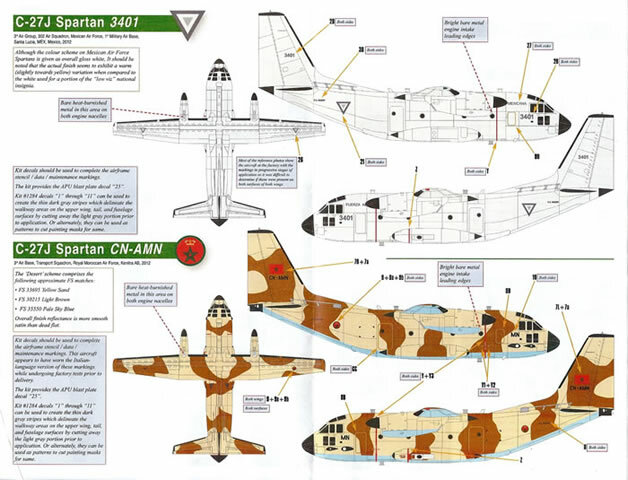 The decal sheets reviewed here as they enable a number of colourful camouflaged aircraft to be modelled. Both sheets still have several overall-grey options included, but this is compensated for by offering some less commonplace national markings. 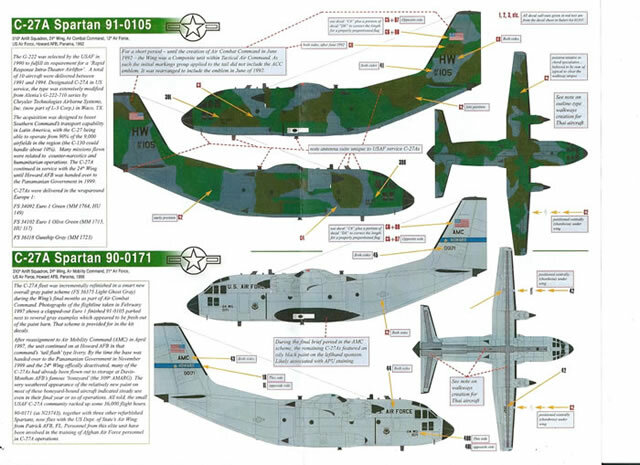 There is also a choice of US aircraft that at least differ from the kit options. The decals come packed in the near universal A-5 sized zip-lock plastic bag containing instructions and two sheets of decals in each case. The instructions are produced to high standards with several A-4 pages in colour. Notes on each subject accompany each guide as well as colour images of the aircraft. In fact, they provide a number of details specific to each subject that aid authenticity. The painting and decaling guides look easy to follow; colour call-outs are cross-referenced to FS.595 and the Model Master range of paints. There are also notes on external avionic variations between aircraft and other points of interest. 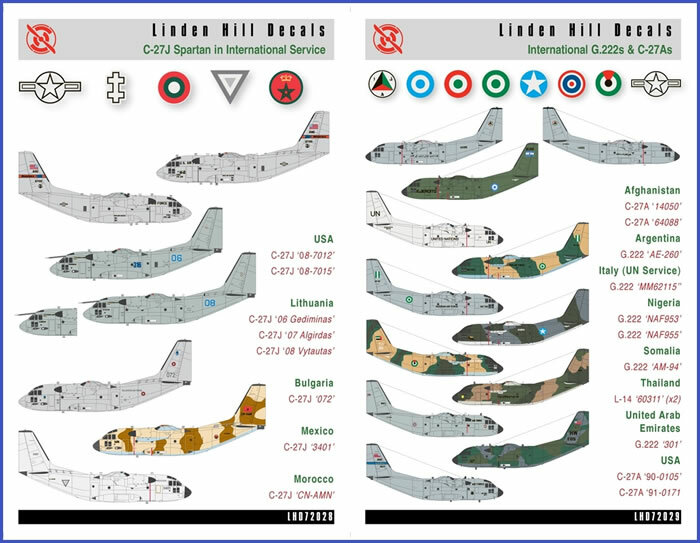 The C-27J sheet also includes a series of bi-lingual stencils that are cross-referenced to the Italeri’s stencilling guide, as they are direct substitutes. USAF: 08-7012 & 08-7215 of 179th ALW , Ohio National Guard, deployed to Kandahar Air Base, Afghanistan August 2011 through May 2012. Lithuanian AF: Blue 06, 07 & 08, 1st Aviation Base, Transport Squadron, Siauliai –Zokniai Air Base, Lithuania 2012. Bulgarian AF: 072, 1st Transport Aviation Base, 1st Squadron, Sofia Vrazhdebna International Airport, Bulgaria 2012. Mexican AF: 3401, 3rd Air Group, 302 Air Squadron, Military Air Base, Santa Lucia, Mexico 2012. Royal Moroccan AF: CN-ANM, 3rd Air Base, Transport Squadron, Kenitra, Morocco 2012. 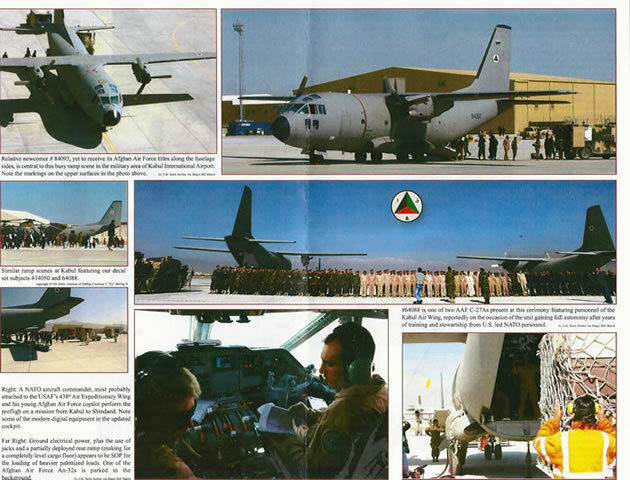 C-27A, Afghan National Army Air Corps: 14050 & 64088, Kabul Air Wing, Kabul International Airport, 2010-2012. G,222, Nigerian AF: NAF953, 88th Military Airlift Group, Lago-Ikeja Air Base, Nigeria 1986. 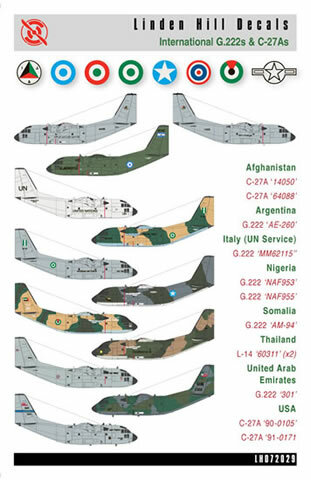 G,222, Nigerian AF: NAF955, 88th Military Airlift Group, Lago-Ikeja Air Base, Nigeria 2012. G.222, Somali Aeronautical Corps: AM-94, Mogadishu International Airport, Somalia, early-1980’s. G.222, United Arab Emirates AF: Dubai Defence Force Air Wing, Dubai International Airport, Dubai, 1978. G.222, Argentine Army Aviation: AE-260, 601st Combat Aviation Battalion, Campo de Mayo, San Miguel Air Base, Argentina 1982. G.222, Italian AF: MM62135, 46a Aerobrigata, Pisa Air Base, deployed to Eritrea as part of the UUN mission in Ethiopia & Eritrea, December 2000. G.222, Royal Thai AF: 60311 (Early), 603rd Transport Squadron, 6th Wing, Bangkok-Don Muang Air Base, Thailand 1996. G.222, Royal Thai AF: 60311 (Late), 603rd Transport Squadron, 6th Wing, Bangkok-Don Muang Air Base, Thailand 2012. C-27A, USAF: 91-0105, 310th Airlift Squadron, 24th Wing, Air Combat Command, 12th Air Force, Howard Air Base, Panama 1992. C-27A, USAF: 91-0171, 310th Airlift Squadron, 24th Wing, Air Mobility Command, 21st Air Force, Howard Air Base, Panama 1998. Both decal packages appear very well researched, with thorough attention to detail, and are produced to the highest standards. They offer a wide choice of colour schemes and the chance to build a model in the colours of several smaller air forces. As such, they are a most welcome alternative to the kit markings.